One of the things I've been meaning to do for years is make some cute Christmas pillows for the bed. I have mostly white bedding (at the moment), plus the red and white duvet set from IKEA that I got when I first got my bed (Craigslist!). So at Christmas I thought it would be cute to have some red and white pillows, kind of a Scandinavian feel. The first pillow I made was with this cute house fabric I've had in my stash for ages. I quilted it in chevrons to match the rooflines, then bound it in natural linen. I used my standard pillow cover tutorial with an envelope closure in back, but with the quilt binding instead of turning the cover inside out. I made it the size to fit the little decorative rectangular pillow that's usually on the bed (you can see that here or here), and I really think it turned out well. I was trying to decide on another pillow, and I didn't have any other red and white fabric that was big enough... or so I thought. I had about given up when my son found this piece of vintage chenille in my fabric cabinet. It was exactly the right size, like it was made for the project. I decided to go simple and just did a simple envelope enclosure again (again with my pillow cover tutorial), but just turned, no trim. I love it. At first I was thinking I'd use them in different parts of the room, but I liked them so much together that I just piled them all up and enjoyed them. 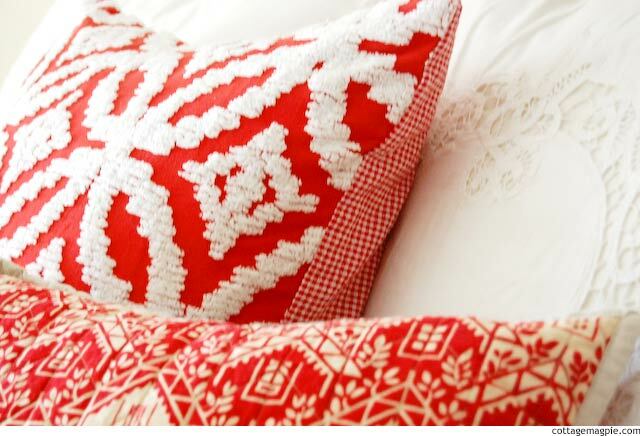 I've got even more pictures of these pillows in my post about my bedroom Christmas decorations. Did you make anything new this Christmas? Do you like red and white at the holidays?